Where is the composition tab in QGIS 3.0 Composer, so I can change page size? 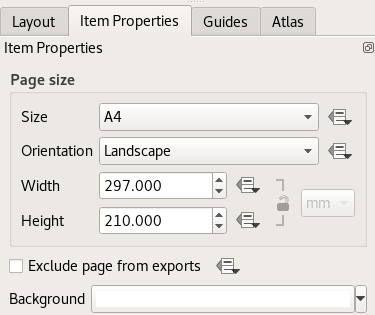 I am trying to change the page size in the QGIS 3.0 Composer but I am not able to see the Composition tab. I have right clicked an empty space in the toolbar but did not see anything about composition. I am using Windows 7. I tried looking at the QGIS docs but they are still in testing. Not the answer you're looking for? Browse other questions tagged qgis qgis-print-layouts or ask your own question. How can I change the frame in the print composer in QGIS?